Aéroport DE Charles de gaulle is the most important airfield in Paris, France and also the second busiest airport altogether of Europe after London Heathrow. It covers an area of about 8,000 acres, and has 3 major terminals. Terminal two was the largest of the 3 terminals, with 2E, the most recent addition, designed to be the “the most powerful hub in Europe, prior to frankfurt and London”. Leading the exciting 750M euro expansion to the terminal was the legendary French airport architect, Paul Andreu, WHO had designed the remainder of CDG. It received rave reviews upon its inauguration for its “daring style and wide open spaces” and was referred to as the “crown jewel of the CDG”. 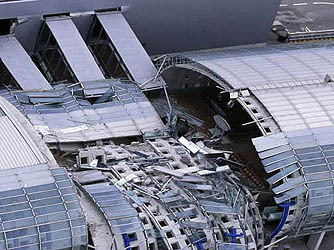 However, about eleven months after its inauguration on twenty three may 2004, a considerable portion (about 30m) of the bowed ceiling fell, killing four and injuring 3 travelers. The scene was described as “cataclysmic, like an earthquake”. Experts, at first, were unsure on the reason for the terminal collapse, considering that it had just been praised for its unique steel and glass style eleven months ago. only later did it become clear that it had been a combination of many factors that contributed to the disaster. One of the main factors that prompted the collapse was that the design for the building had little or no margin for safety, therefore the construction process had to minutely exact in order for the building to achieve success. 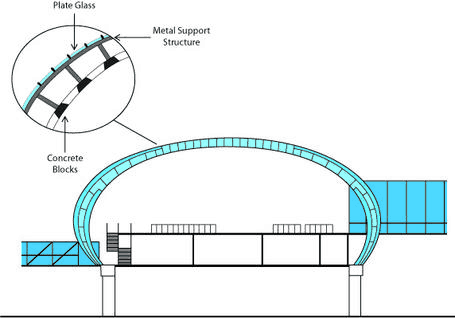 The bowed ceiling had 3 layers: an outer layer of glass, a middle layer consisting of a metal support structure, with the third layer being the concrete blocks that supported the metal and glass. it had been found that the metal support structure was too deeply embedded within the concrete blocks, that caused cracking inside the concrete, weakening the complete structure. It additionally placed lots of tension on the outer layer so as to keep up stability. 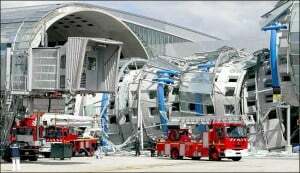 The architect, Paul Andreu, additionally blamed the construction company for not mixing and preparing the reinforced concrete properly, resulting in its collapse. it had been additionally found that rapid thermal enlargement might have had an influence in causing the collapse, as in this specific day the temperature born considerably (from 25C to 4C). The collapse of the “crown jewel” of the CDG was seen as a huge embarrassment to France within the international community additionally as for the architect Paul Andreu. The terminal reopened again in 2008, when a 100M euro project to switch all the glass and steel with concrete so as to insure the same issues wouldn’t happen again.